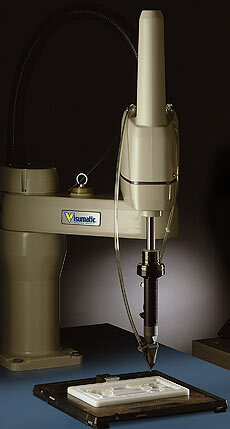 Viper 4-Axis Robot | Automatic Screw Feeding & Driving Machine from Visumatic. Application: Top of the line assembly robot for lightning-fast, error-free fastener feeding and driving. The fastest screw installer available, the state of the art Viper 4-Axis Robotic System is a truly programmable feeding and driving system. It is designed to be lean and extremely flexible, and can be completely reconfigured for your future production needs. Lowering cost of ownership. Visumatic configures the system's infrastructure as a building block with programming, interface, electrical, pneumatic and paint schemes to suit. Its flexibility meets nearly any requirement. Automatic screw feeding and driving SCARA robot with vision options for drive location and part inspection in automated assembly. The range of feeder designs available guarantees Visumatic can accommodate your part and any fastener you need to install today and in the future.